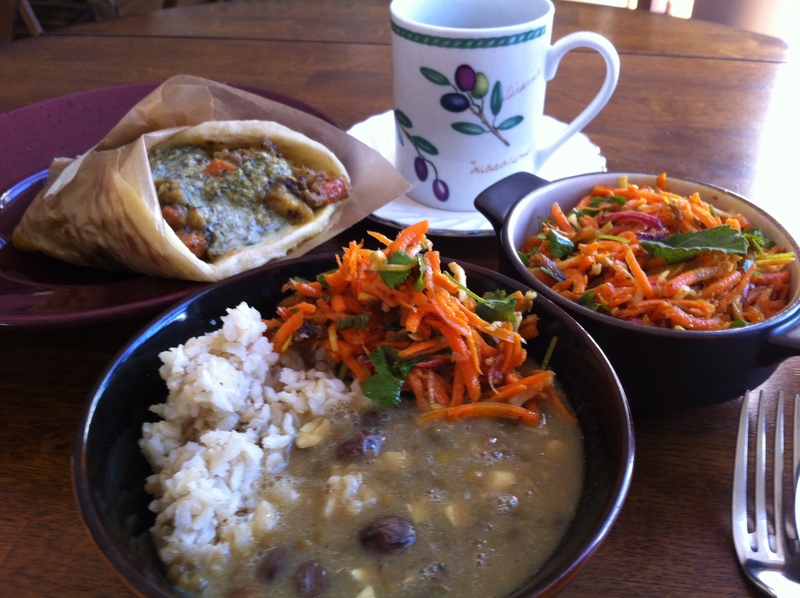 So I wrote about Tulsi Tea Room in 2009, when it first opened as the Tulsi Tea Collective. 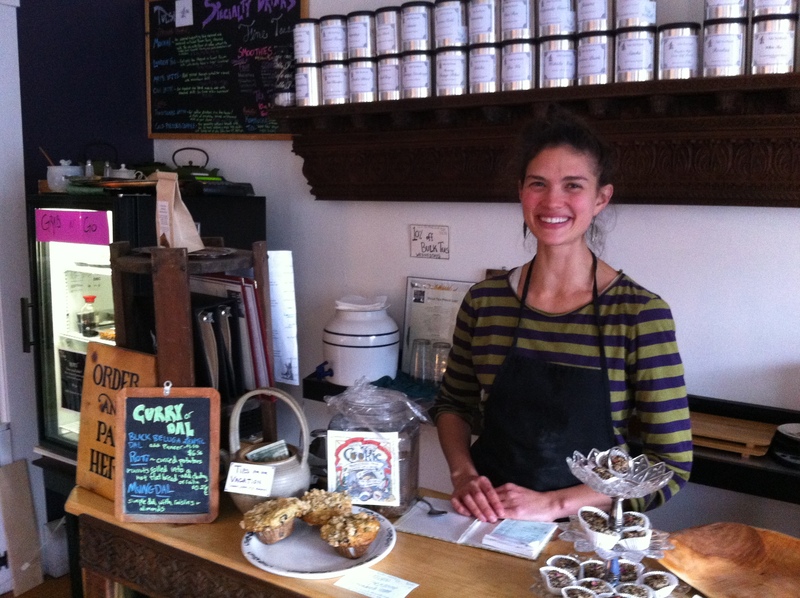 Solenne Thompson, one of the original collective members, took individual ownership of the teahouse this past summer, and under Thompson’s leadership the teahouse has retained its warm, inviting flavor while expanding its food and beverage offerings. Learn more about Thompson, Tulsi’s lunch and grab-and-go offerings, and the restaurant’s semi-controversial equipment addition in this week’s Montpelier Bridge. Fresh Tracks Farm Vineyard & Winery in Berlin presents a Bluegrass Festival on Saturday, September 22 from 11 a.m. – 6 p.m. Enjoy their wines by the glass, wood fired pizza, and live music by Tallgrass Getdown and Something with Strings. For the kids: popsicles and a bouncy house! Bring your lawn chairs or blanket and enjoy the season. It’s a fine time of year to visit the Kingdom. The Vermont Fresh Network’s next Farmers’ Dinner is this Sunday, September 23 at the Parker Pie Company in West Glover. The shindig features pot-au-feu and cranberry-glazed goat, along with seasonal salad and dessert. $50 per person; call 525-3366 for reservations. Stomp some grapes at the Boyden Valley Winery Harvest Festival, also featuring food, wine, and grape tastings; tours; and hayrides all day. September 22 & 23. Proceeds will benefit Camp Ta-Kum-Ta, a safe and challenging camping experience for Vermont children who have had cancer. Pick Your Own Potatoes at Chappelle’s Farm in Williamstown. 30 cents a pound – you follow the digger. Bring your own containers (buckets are good). Sunday, September 23, 9 a.m. – 5 p.m. South Hill Road, Williamstown – follow the signs from Route 14 south of Williamstown. 433-5930. On October 2, the Uncommon Market will celebrate its 5-year anniversary. They will be celebrating with music, birthday cake, an in-store wine tasting, face painting, and lots of free samples of tons of our food. Stop by to say happy birthday! Need a job? The Three Penny Taproom kitchen is hiring! Great food, and I gotta think there’s a perk or two, too. Send your resume to matthew@threepennytaproom.com. Matthew’s back in the kitchen! I’m not one for rankings, but Matthew Bilodeau is one of my three favorite Vermont chefs. I loved his food when he was cooking at the [old] Black Door, and I’m psyched he’s back in action at the “new” Three Penny Taproom. From Matthew’s cooking I’ve learned to love swiss chard, celeriac, and Tarentaise cheese. He cooked one of the best steaks I’ve ever had. The guy’s been working 100-hour days to open the kitchen at the Taproom (see today’s Times-Argus story), but he’s happy as a clam. Granted, he has no time to watch the Tour de France during those days, but he’s content with the midnight recaps, he says. Will he have time to watch any Olympics, between cooking and canning all the tomatoes coming in the door? “They never show track bike racing anyway,” he says of his favorite event. Whatever they have, when cooked by Matthew, is always great, and I highly recommend the Taproom for lunch or dinner. Lots of great food events happening this weekend; if Dad’s a gourmand, take him out for a delicious Father’s Day! Tonight (Friday), Ariel’s Restaurant in Brookfield is hosting an Andalucian dinner in cooperation with Scragg Mountain Music, a local musical company sponsoring a weekend of madrigals and the poetry of Spanish poet Federico García Lorca. The Andalucian menu includes tapas, paella, and olive oil cake. Chef Lee Duberman generally does everything right, so she’s sure to ace this Spanish menu. The 3-course prix-fixe meal is $40, or $60 with Richard’s expert wine pairings. Dinner’s at 6 pm; the music starts across the road at 8 pm. Dinner reservations at 276-3939. Saturday, check out Americana band Bovine Social Club and special guest Patrick Fitzsimmons in concert at the Tupelo Muisc Hall in White River Junction. The show is sponsored by NOFA-VT and will benefit the Vermont Farm Share Program, which provides subsidized CSA shares to limited-income Vermont families. Tickets are $25 in advance and are available at the Tupelo Music Hall by phone at 603-437-5100 or online at http://tickets.tupelohallvermont.com. Sunday, join the Floating Bridge Food and Farms Cooperative for a Father’s Day Farmers Market at the Brookfield Old Town Hall from 12-4 pm. Don’t make Dad man the grill on his special day – there will be lots of grilled meat for lunch, and more meat from FBFFC member farmers to take home (bring a cooler). Enjoy live music and swimming in Sunset Lake. It’s also Ariel’s Restaurant’s 15th anniversary, and cake will be served, so come celebrate Dad, Ariel’s, and summer in beautiful Brookfield. 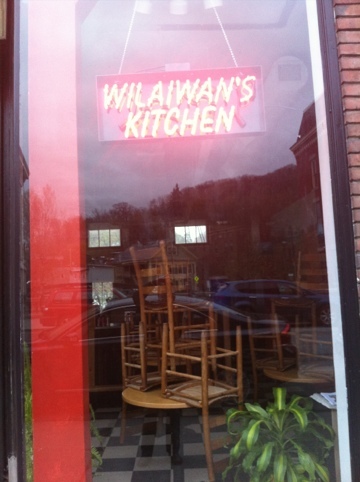 Looks like Wilaiwan’s Kitchen — the famous “Thai Cart” of Montpelier — is just about ready to open! Anyone know when? I’m one of those people who cries almost at the drop of a hat, but it’s rare for me to get choked up during an interview. This month, though, was different. As I spoke with Kimberly Lashua, director of the Montpelier Food Pantry, I found myself tearing up at the fact that, as a culture, society, and world, we continue to allow a system which denies so many people the adequate, meaningful employment that’s necessary to ensure economic self-sufficiency. So we continue to have food pantries and food banks and soup kitchens in this country; and “international food aid” (which is not always exactly that) in our global sphere. I know it’s more complicated than that; and I do believe that it’s our collective responsibility to care for those less fortunate. So I’m glad there are food pantries and food banks and soup kitchens and international food aid. But sitting in the office of the Trinity Church, talking with Kimberly, I wished there was more focus on restructuring our economic system so that everyone could experience true economic self-sufficiency — and the dignity and self-respect that comes along with that. This week’s Montpelier Bridge is the annual Food Issue, and it’s a good one. Read more about the Montpelier Food Pantry and Just Basics, its parent organization; how Food Works continues to meet its mission of teaching people to feed themselves; what local food products are served in Montpelier restaurants; controversy at the Montpelier Farmers Market (will Pete’s Greens be allowed to vend this year? ); and much more. If the system is to change, we must all work to change it. I ask myself, what will I do? I ask you: what will you do? Thanks to the many parents who chimed in with healthy snack ideas for this week’s issue of the Bridge. Buzz Ferver of Worcester says his kids love nori sheets, cut into tiny squares. According to the Eden Foods website, nori (a toasted sea vegetable which is dried and flattened into sheets) provides minerals, vitamins, trace minerals, iodine, and protein. Jenny Stone Muilenburg of Seattle notes, “my kids will eat almost any vegetable that’s been roasted and salted: broccoli, cauliflower, asparagus, green beans, garbanzo beans…” For that last one she recommends Mark Bittman’s recipe for roasted chickpeas. Once roasted, these chickpeas are a great finger food for kids above the age of choking risk. Special thanks to Montpelier naturopath Lydia Faesy, ND, for sharing some recommendations for healthy snacks for children. She suggests making nut butter balls from a combination of nut butter, dried milk, raisins, honey, coconut, seeds, granola, and/or wheat germ, all mixed together and baked, or unbaked and rolled in coconut flakes. Careful about taking these to school, though — to accommodate students with allergies, many schools restrict snacks that contain tree nuts.